This Project is part of a broader collaborative effort to restore multiple reaches of the Upper Truckee River and improve Lake Tahoe water clarity. It will also improve recreational opportunities, trail connectivity, community economic vitality and the environment. 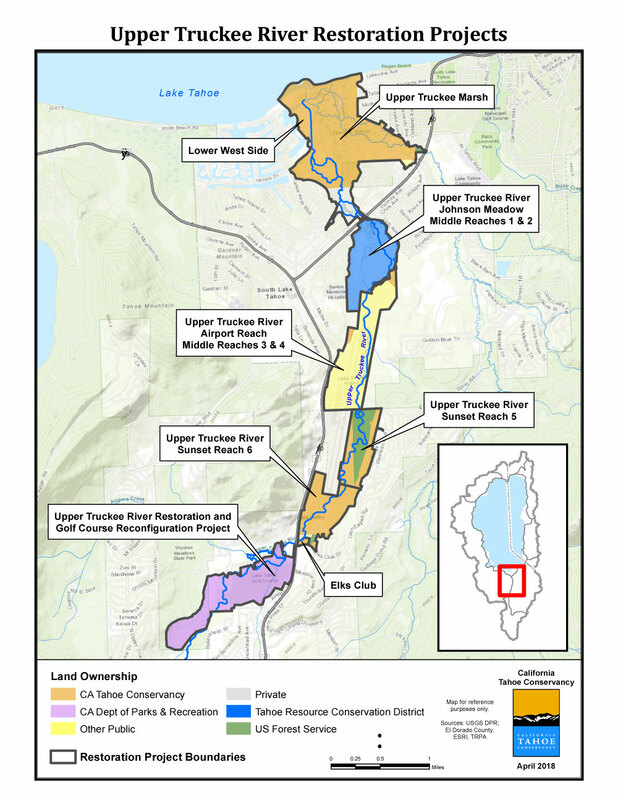 The Upper Truckee Watershed river reaches are owned by the Forest Service, State of California, Tahoe Conservancy, Tahoe Resource Conservation District, City of South Lake Tahoe and California State Parks. The restoration effort extends from the headwaters to the mouth of the river at Lake Tahoe in order to reduce sediment, improve clarity and improve both riparian and meadow habitat. The Upper Truckee is the largest river that flows into Lake Tahoe, and it is also the biggest producer of sediment. The river has been negatively impacted by historic disturbances, modern development and it is in need of restoration. These impacts are ongoing, and will continue into the future if the stream is not restored. Golf course fairways extend to the edge of the river resulting with a lack of a buffer zone and no riparian habitat. This photograph shows eroding banks and failed rock stabilization along the Upper Truckee River. California State Parks acquired the property in 1985 and it was divided into two contiguous units along the Upper Truckee River. The golf course was constructed on the incised meadow floodplain area in 1958-1962 and designated as Lake Valley State Recreation Area to allow for continued golf recreation. The remainder of the parcel was classified as Washoe Meadows State Park and Lake Valley State Recreation Area. The park units were subjected to a number of disturbances prior to acquisition by California State Parks. The glacial terrace was mined for gravel (borrow pits), the meadows were grazed, sewer lines, railroad grades, roads and dirt race tracks altered drainage patterns and disturbed vegetation. The forests were logged, leaving a myriad of roads and skid trails. Lack of natural fire coupled with drought and infestation have also led to a decline in forest health. Prior to the 1940s, this section of the river was straightened, leading to down-cutting, loss of connectivity to the floodplain and degradation of habitat. The river is still adjusting to this disturbance today as evidenced by unnaturally high erosion rates. This erosion in turn produces clarity-reducing sediment to Lake Tahoe. The golf course was built on the previous floodplain/meadow area in 1958-1960, further degrading habitat as several of the holes are located along the river’s edge. California State Parks has completed, or is in the process of doing, a variety of resource management and restoration projects in these units. The land use history has resulted in a substantially altered channel. 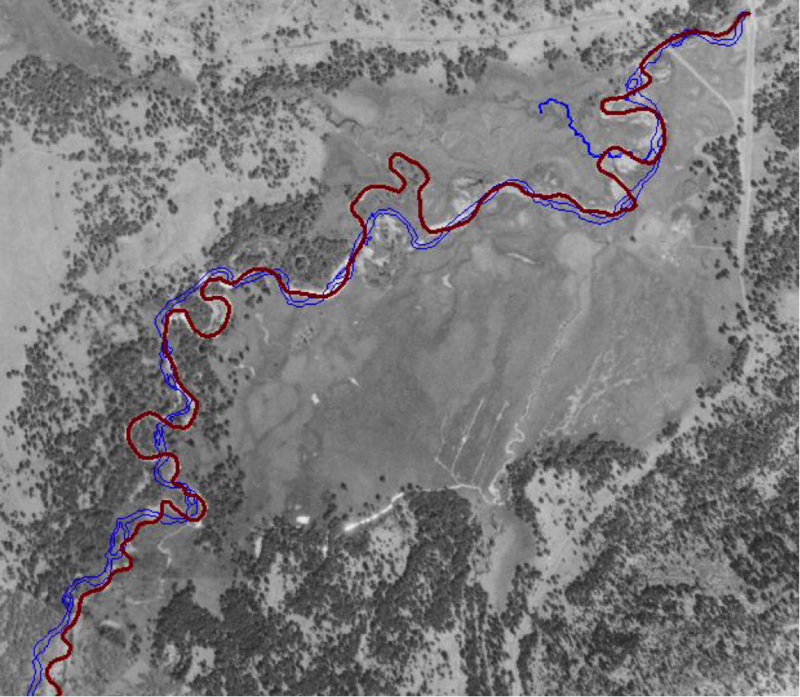 Channel length and sinuosity (curviness) have been reduced throughout the lower river (see 1940s aerial map photo below). 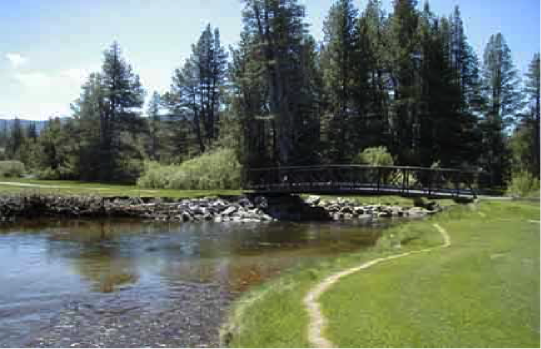 Straightening of the channel pattern accelerates water flows and causes bank and stream bed erosion, which increases transport of fine sediments into Lake Tahoe. And as the stream erodes the river bed, it got deeper (incised) and lost connectivity to its floodplain. These geomorphic impacts have lowered the water table and negatively impacted riparian vegetation communities and meadow and aquatic habitat. Again, these impacts are ongoing, and will continue into the future if the stream is not restored. This 1940s map photograph shows how the river has been modified. The red line shows the river course in the 1940s, reflecting its natural meanders. The blue line shows the present-day configuration and how the river was channelized and straightened.